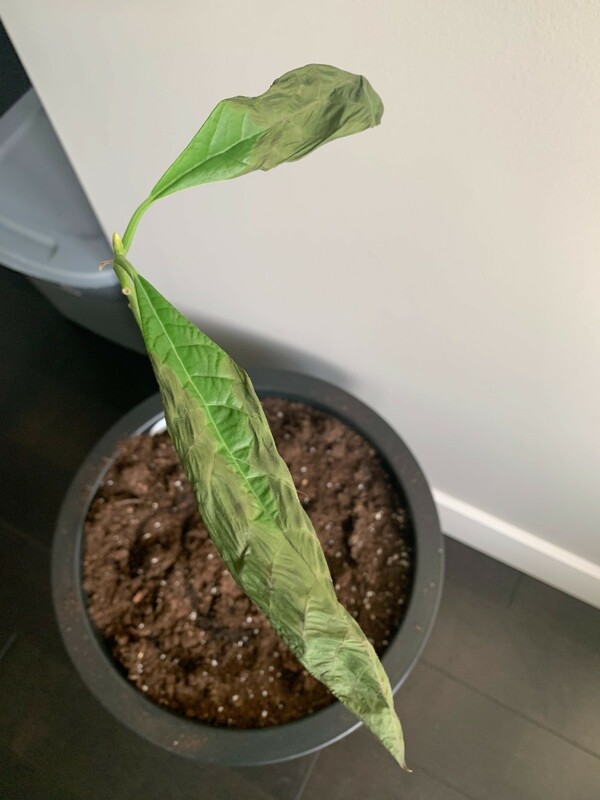 If the leaves on your avocado plant are dying, it may be a sign of serious stress from something like a fungus or parasite. 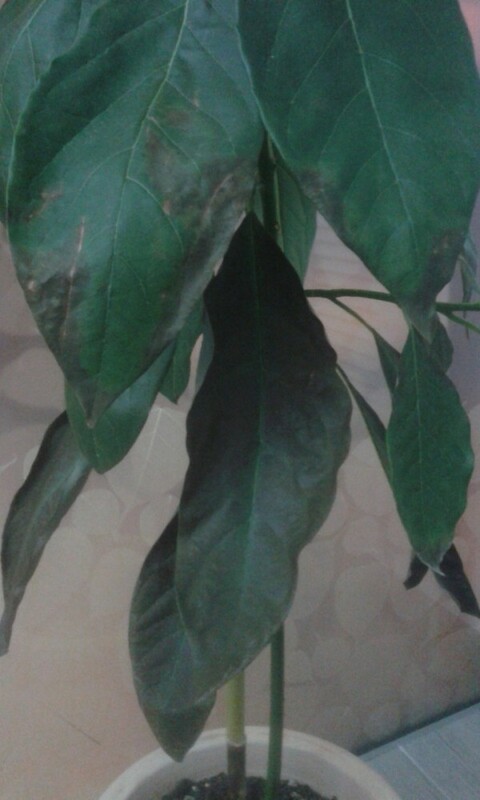 Leaves dying on an avocado plant is not a sign of good plant health. We have an avocado plant started from seed, which is really shooting up. 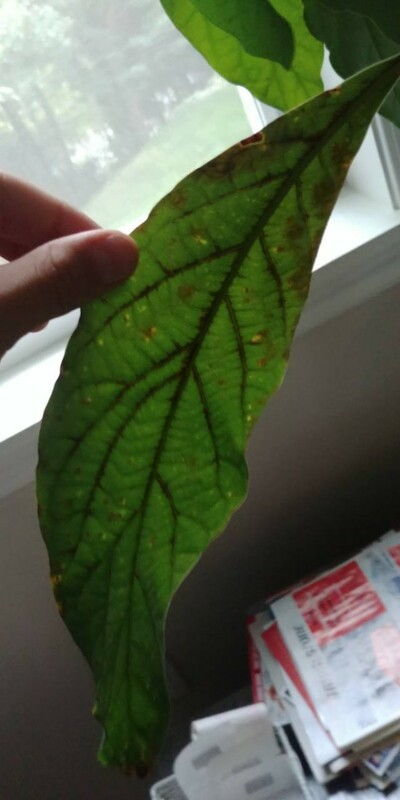 It has nice large leaves on it but the lower leaves keep turning, curling and dying off. No problem with new ones sprouting but why are the lower leaves turning? It is about 20-24" tall. Do we need to bring it in for the winter? What do I need to do to keep it alive thru the winter? Avocados lose their leaves for many reasons. Too much water and not enough sunlight can cause leaves to turn yellow and lower leaves to drop. If your plant continues to sprout new growth, I wouldn't worry. Avocados are also self-thinning. They naturally shed a large number of leaves during periods of rapid growth-especially older leaves. In nature, the leaf litter naturally composts beneath the tree, adding organic nutrients to the soil. If your avocado is getting tall and leggy, you can pinch back the stem a bit to encourage it to branch out. The most important element is to provide it with enough light. As for keeping avocados outdoors during Oklahoma winters, it won't work. You'll need to bring yours in. Avocados are sub-tropical plants native to southern Mexico. They need semi-humid climates and temperatures between 60°F-80°F. You can grow yours in a container and move it inside during cold weather. The cooler temperatures will signal a rest period for the plant. During this time, place the plant in your coolest room with bright light (not in direct light) and reduce feeding and watering until you can return it to the outdoors. 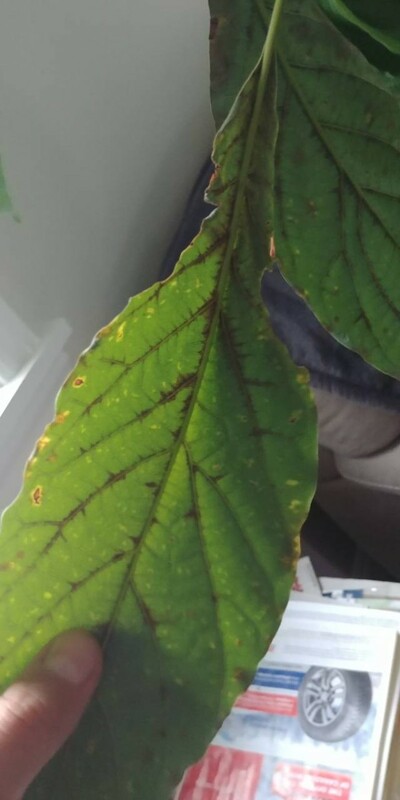 I have a mature 10 ft 8 yr old avocado tree and the leaves are turning yellow and the 30+ fruit on the tree are red skinned, but turn brown when picked and stored. 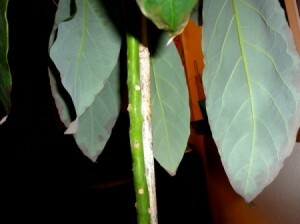 It's close to another avocado tree which has the normal dark green leaves. It receives normal fertilizer annually. We are 200 meters from sea. Other avocado trees nearby in the settlement are normal. Is my tree dying or can it be saved? Thanks for any help. I found info on yellowing leaves: Yellowing leaves indicate iron deficiency, that can be caused by overwatering or lack of nutrients. They say a chelated foliar spray containing iron will correct this deficiency. Don't know your feeding setup, but they suggest they be given a multi-purpose fertilizer 4x a year. I started 2 avocado trees from the seed. They are about 10 inches high. I have them in pots right now, but on one of them the leaves have started curling down all along the edges and turning yellow and orange. Do these trees lose their leaves in the fall? Or is something wrong with my seedlings? Also when should I put them in the ground? I hope you have an answer for me. These trees only really do well in a California type of climate, which is essentially dry and mild. 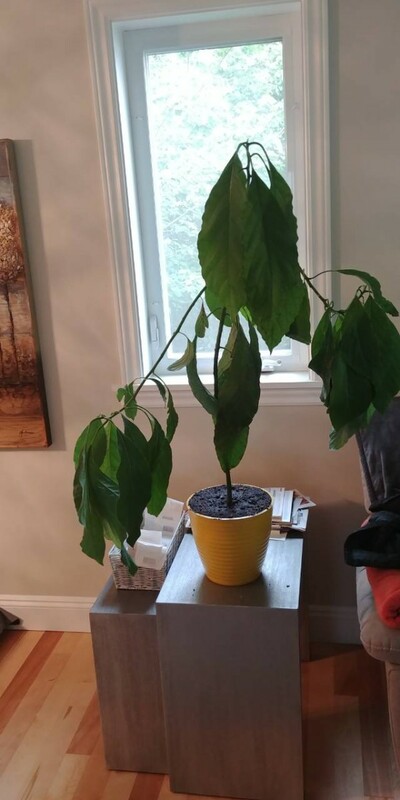 I have tried planting avocado in Georgia, and they did not like the weather and did not like it when fall/winter came. You might want to make sure that it doesn't have a virus, or that you are neither over nor under watering it. I've had my avocado tree for a long tine, it was growing great, tall and wide. It was in a small pot before I replanted it into a bigger one, where it had more space. It has been doing great since then. It was growing bigger and bigger, in about 8 months I've decided to replant it into a bigger one. I used a metal spoon to help it get out if the pot. Once I took it out, I noticed that the roots had grown into the drainage holes and when I took it out the roots in the drainage holes ripped from the ones in the dirt. I planted it in the bigger pot and left it outside for 5 to 10 minutes. When I looked at it, the leaves where down and it looked sick, so I took it right inside. After 2 days the leaves were still down. But recently I noticed that the leaves started to have weird brown marks on them, and those weren't burn marks. As you can see on the picture it looks like an illness. What is it and how can I help my friend? It looks more like it isn't getting enough nutrients (nitrogen is the biggie). You mentioned cutting the roots when transplanting, that may have cut it's food supplies. You could try a very small dose of fertilizer meant for avacado like Scott's makes one. Your garden center can give you the local favorite. See if that helps. Prayers for your leafy friend! That should work. Any one that is specific to plant like this one! Good luck! Let me know when it perks up! I would hesitate to add anything until you know for sure what your plant may need and it is not recommended to add fertilizer to a sick plant (although your plant may not be sick). I feel sure part of the problem is stress from transplanting as you say you just changed pots 5 months ago so your plant may have just been getting back to normal before this transplant. The loss of part of the main root would also cause shock/stress. Did you leave it in the sun for that few minutes you left it outside? If so, that is another shock since it has been inside all this time. Do you not have an Ace Hardware or True Value Hardware in your area? As a general rule they have excellent plant people who might be able to help you bring your tree back to life. You may need an insecticidal soap if there is any type of disease/fungus but they can tell you this also. I would take 2 or 3 leaves to them and tell your story to one of their experienced people and see if they can help you. I love to use Jobe's fertilizer as it is a controlled product so there is no chance of giving too much to an already stressed tree. Google Ace or True Value with your zip code and maybe there is one in your area. I recommend those over Target, Lowe's, Walmart, Home Depot as it is rare to find someone with plant knowledge in those stores - usually just clerks/salespeople. Stick your index finger in the soil up to the first knuckle. If it feels dry, water. It is possible that the plant could be doing this from either too much water or too little water. Avocado plants don't like soggy-bottomed planters (in fact, if the roots are black, they are probably dead). They also need to have light. I would get a cheap lamp and place it next to the plant. This will give them something to grow towards. You might get a few more plants, of any kind, cheap ones, because sometimes plants get lonely. Please help me I am in desperate need of assistance. 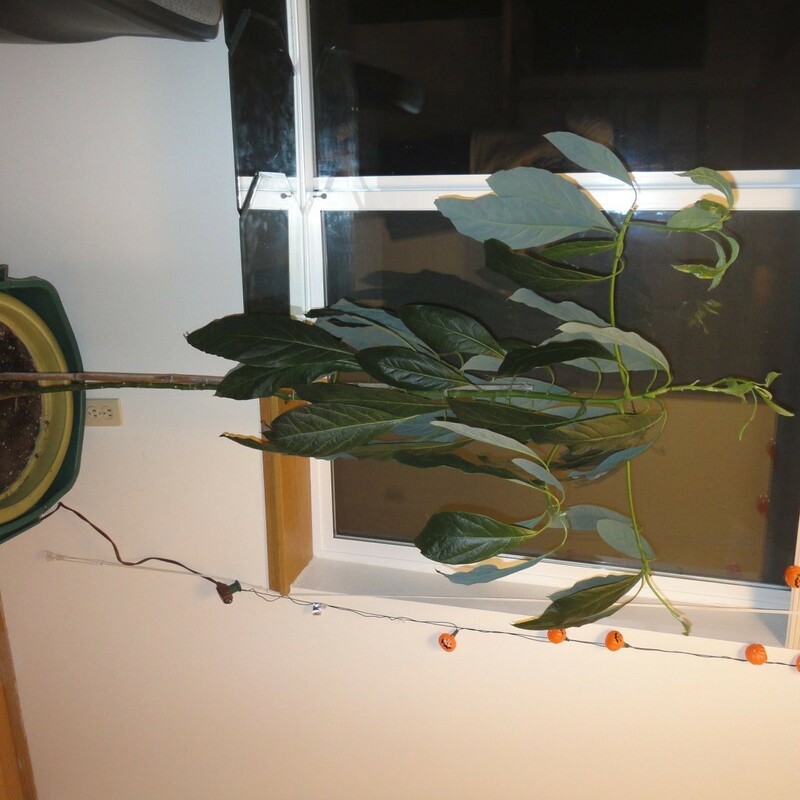 I live in East Lansing, Michigan and have been growing an indoor Avocado plant since this summer. Everything seemed to be going very well until recently. Firstly, let me say that I do not know the type of seed nor have I ever pruned my tree (I don't know how to or if I should). Right now, my plant is a little taller than 1 foot. It is pretty straight up (spindly) and gets a good amount of sunlight. Here is the problem: recently, I have noticed that almost all of the leaves have fallen off. There are still a few leaves at the top and there even appears to be new leaves sprouting from the very top. Some of the larger leaves literally fell off at the slightest touch. 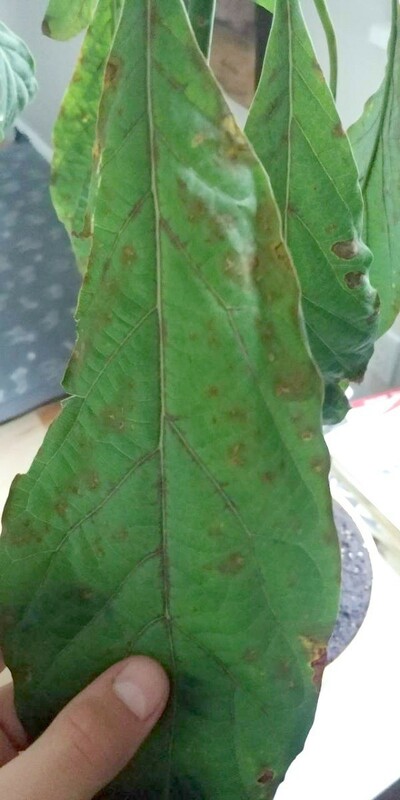 Is this simply a natural phase my plant is going through or are there any measures I should be taking to improve my plant's health. I would be really upset if it died and would really appreciate any help you can provide. I do not give it plant food, but I do have it planted in potting soil containing time release plant food. How often should I completely change all the soil and how do I do that without damaging the tree? So, in sum, why is my plant so ugly (for lack of a better word)? why are all the leaves falling off? What kind of soil and/or plant food would you recommend? Should I change the soil? If so, how do I do it? And finally, should I prune it? If so, how do I do it? I think you may have over watered it. If that is the case it probably will not make it, sorry. I would not feed it either we have never fed ours and we have about 30 trees(my hubby just can;t throw those seeds away!). Let it dry out a little between watering, then water completely till it runs out the bottom, but do not let it sit in water. I usually cut mine back at about a foot high down to 6" or so. Avocados do not like to be repotted, that is why they suggest to first pot it in a fairly large pot. Remember It is really easy to start a new one if yours does not make it and fairly inexpensive. Think guacamole, yum. Just google starting avocado trees and you will get lots of help. Do not stress the leaves will fall off and in a few weeks the new shoots will appear. Water well once a week and as long as the main stem stays green it will recover. 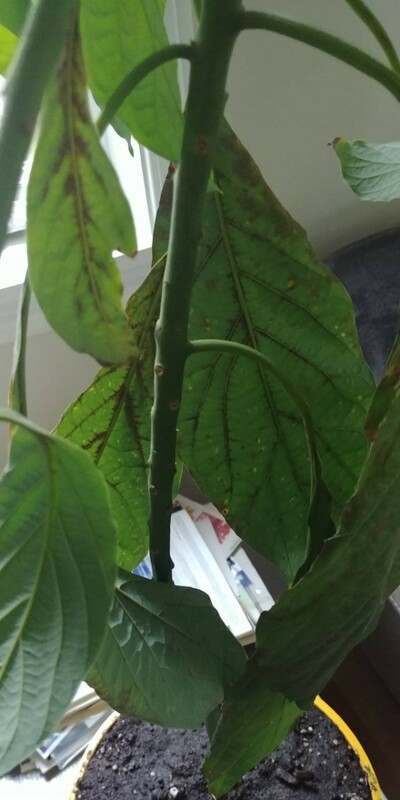 I also live in Michigan and have been growing an avocado tree inside in winter and outside in summer. 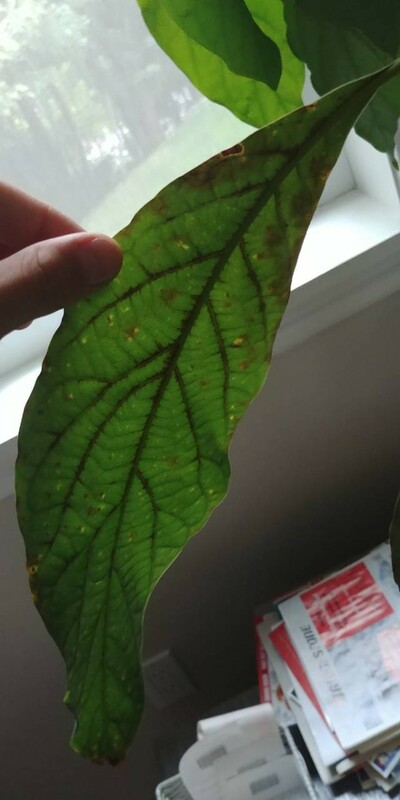 My leaves are browning and falling...I know this is apart of the process now so I wont worry too much! BUT I am nervous to cut my tree back although I know it needs it-my tree is 2-3 feet tall and he a bend in it DO I Cut it back by half even if its inside? Thank you!!!! 3 weeks ago my 1 year old avocado tree was hit by a wind storm that almost uprooted it. Since then, I moved it indoors, where it spent its first winter, last year. More recently, about 1 week ago, part of its leaves, mainly the oldest, but also some of the younger ones began to turn dark and dry. Is it a normal reaction to having less sunlight or is it something I should worry about? This can be an accumulation of salt. Once a month water deeply to get the salt out. When the tree was outside and the wind uprooted part of the tree it has gone into shock. This is normal. During the winter months in some states the leaves will turn brown and fall off. This is also normal for the tree. You can remove the dead leaves off the tree to make it stronger. There is no need for the tree to work hard to survive and have to try and keep the dead leaves alive on the tree. While the tree is in your home, give it as much sunlight as you can. Place it near a window if you can do this. There is another thing you can do. I had an avocado tree that the leaves die on and fell off. I cut the trunk of the tree in half. The leaves started growing back and the tree is much stronger now. You can try this too. I have two avocado trees, one is one year old and the other is 2 years old. The containers where I have them planted are getting small and I decided to transfer them to another bigger container and after a week their leaves became brown and they are dying. Can you tell me why? and if there some way I can recover then before they die. I have to mention that I'm living in Osaka Japan and here in winter is a little cold. I have been trying to sprout one for years. Congratulations! My avocado plant is about a foot tall with two long and skinny branches that are sticking out. 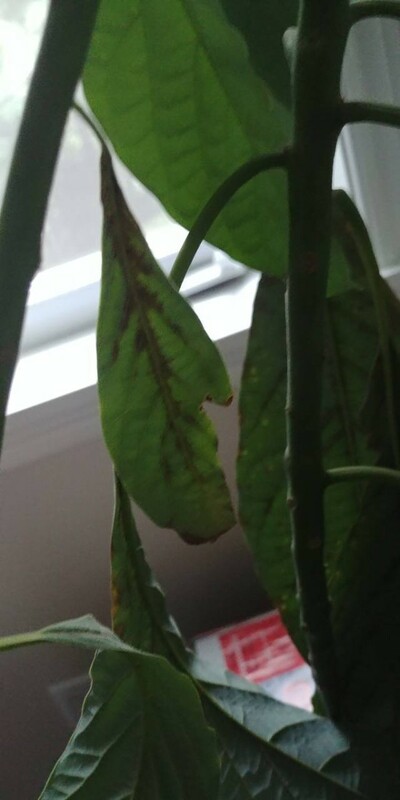 There are a few dying leaves on the plant with some smaller leaves trying to grow. What is the problem and what should I do? Make sure it is in a soil that drains well, the soil should be soft and not packed like clay. Avocado trees do not like being touched or being in the wind. Move it if it is in a windy area. Shade of another tree is a good place to keep an avocado tree or near the North side of a building. Fertilize the avocado tree four times per year once it is 1 year old. Young trees should not be fed. Use a balanced fertilizer with an equal ratio of nitrogen-phosphorus-potassium. If you have an older tree that won't bear fruit, give it a nitrogenous fertilizer in late winter and early summer. Soak the roots well when watering an avocado tree. Let it dry out between waterings. Depending on your climate, this may mean watering every day or once every few weeks. Cut off dead or diseased foliage and limbs. They could be spreading disease and preventing your avocado tree from bearing fruit. Use shears to cut where the unwanted wood meets healthy wood. Don't severely prune an avocado tree or it will kill it. Here is a video on how to grow Avocado trees from seeds. I have two avocados in two of the same type pots, with the same soil, and the same watering schedule. I let them dry (about a week or so) and then deep water them till the water comes out of the bottom of the pots. The thing is one of them has it's leaves curling while the other one has healthy leaves. The only difference between the two is that the one that's not healthy was grown from a pit that was not organic. I got the pit at Whole Foods, so I don't think they could do too much harm to them. The healthy one is organic and was also bought at Whole Foods. I started a seed to grow inside about 2 years ago, it grew fine for about 1yr and 2 months then I re-potted it into a bigger pot. It loved the new space it had and took off like crazy! It got plenty of sun for an indoor tree. Then I moved it. It's not getting anywhere close to the same amount of sun and I'm still watering as I always did. When the top is dry I water all the way through, I don't let it sit in water. My tree is about 5-6 ft tall and has been pruned (4months ago before I moved it) and has lots of branches. It's now been about 4 weeks and I have lost almost half my leaves, they seem to be falling from the lowest working its way up. I come home to find a leaf sitting in the pot still green almost everyday. Some of the leaves fall off with the slightest touch, and when looked at in the light all the ones that have fallen have the same spotty look to them. I will have a picture to try and show you. I don't know what to do. I love this tree, and have taken good care of it. Please help me, tell me what you think it could be, or if you know what it is how to fix it. I am growing an avocado tree in my kitchen. All appeared to be going well, but in the last week and a half, my plant hasn't been looking too healthy. 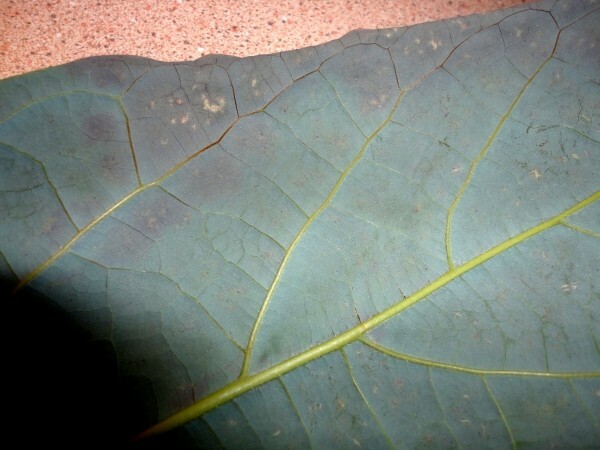 The lower leaves are curling inwards, becoming almost crispy in texture and they are turning an extremely dark brown, seeming black before closer inspection. During this time my plant's condition has spread to nearly half of its leaves. My kitchen is fairly cool in temperature and I have absolutely no idea in which region of the world this variety originates, or how to find out. I keep it in a sunny spot, but not in what I'd describe as direct sunlight. I water it regularly, just enough to keep the soil damp, a deep brown color. 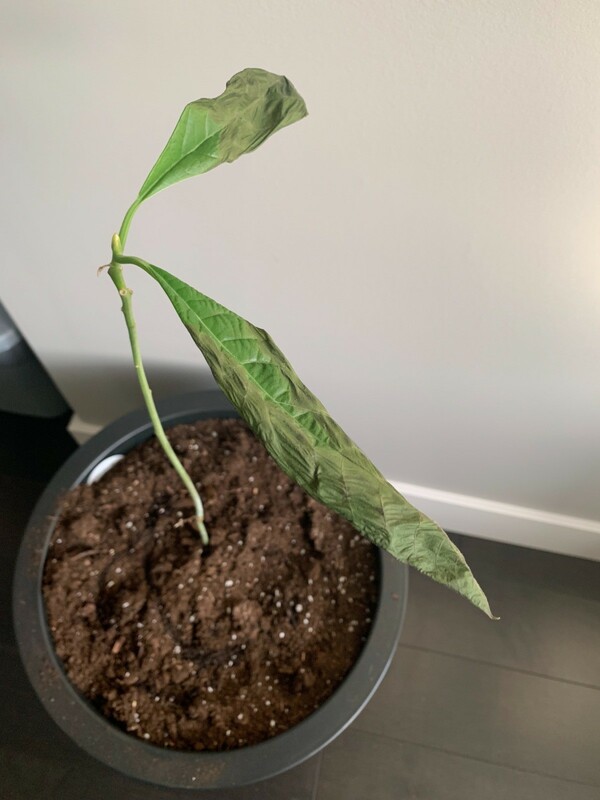 I re-potted my avocado tree about six weeks ago and it seemed to improve in health directly after that, growing very quickly once again, before this problem emerged. Could you possibly give me any advice to help improve its health? I'm rather fond of my avocado tree, eccentric as that may appear. I'd at least like to give it a fighting chance at survival. Many thanks, in anticipation. Don't forget they are trees. Trees have trunks, not leaves at the bottom. Every one I have ever had has lost the bottom leaves eventually. Right. The lower leaves will fall off because it is a tree, not a bush. My 20-year-old avocado tree in the back yard puts out at least 35 bushels of leaves every year. A well-established tree in Central California will survive a week of temps that go down in the 20's every night. Only the outside couple of feet will freeze. Prune them off and the tree will come back with a vengeance. I think we are in zone 9.